Book two nights with Santa Barbara, CA’s “Revive & Thrive” hotel promotion and receive a free third night at 20 participating Santa Barbara South Coast hotels. “Revive & Thrive” packages are available for three-night stays through Mar. 31, 2017, and can be booked directly through participating hotels' websites. Participating hotels range from hideaways and oceanfront resorts to inns and boutique urban retreats. The “Revive & Thrive” lodging packages also include discounts and upgrades on experiences through “Miss Nothing” Experience Kits provided upon check-in. Go here for full promotion details and links to participating hotel partners. “Revive & Thrive” perks extend beyond bonus vacation time. At check-in, receive a “Miss Nothing” Experience Kit to help make the most of every moment spent in Santa Barbara. Kits include a limited-edition Santa Barbara Field Guide and five “Miss Nothing” Experience Tokens. Use the tokens for two-for-one offers, discounts and upgrades from more than 30 participating Santa Barbara South Coast wineries, restaurants, retailers, tour providers and attractions. Among the token offers are two-for-one wine tastings, beer-tasting flights, theater tickets, museum admissions, trolley tours, coastal cruises, rounds of golf, plus bike, kayak and stand-up paddle board rentals. Other offers include discounts on guided wine and food tours, expert-led outdoor adventures and seasonal cuisine. Tokens can also be redeemed for retail rewards and value-adds such as spa treatment enhancements, free chocolate pairings and free gifts. Santa Barbara sits between the Santa Ynez Mountains and the Pacific Ocean along California's Central Coast. Just 92 miles north of Los Angeles, Santa Barbara is accessible through Highway 101, train, bus or by flying into Santa Barbara Municipal Airport (SBA) or Los Angeles International Airport (LAX). Visit Santa Barbara or 800/676-1266. Rocky Mountaineer, the tourist train that travels through Western Canada and the Canadian Rockies, offers its first ever promotion for solo travelers. Available on qualifying vacation packages that depart in April and May 2017, the Go Solo promotion has single travelers paying the per person double occupancy rate. One eligible vacation package is Rocky Mountaineer's Journey through the Clouds Discovery Drive, a seven-night trip through Vancouver, Kamloops, Jasper, Lake Louise, Banff, and Calgary. The Go Solo promotion is valid until May 15, 2017. It is applicable on qualifying Rocky Mountaineer GoldLeaf and SilverLeaf packages of five days or more that start in April or May 2017. The offer must be requested at the time of booking. This offer has no cash value, cannot be combined with other offers, and other restrictions apply. Rocky Mountaineer Go Solo promotion or 877/460-3200. Emerald Waterways offers deals on 2017 sailings. Book a Balcony Suite, including Panorama Balcony Suite, Riverview Suite, Grand Balcony Suite and Owner’s One Bedroom Suite, on any 2017 Europe river cruise itinerary and receive free roundtrip airfare from major U.S. and Canadian gateways. Book a stateroom cabin category on a Europe itinerary and you are eligible for reduced airfare of $795 per person. If you book your own air, you will receive $1,000 air credit in lieu of flights ($600 for booking staterooms). This offer is good on bookings made until Mar. 31, 2017. Emerald Waterways offers river cruises on the Rhine, Rhone, Douro, Main, Danube and Moselle, rivers, ranging from eight to 24 days. New in 2017, is the eight-day Secrets of the Douro itinerary on the new Emerald Radiance, with stops in Portugal and Spain. Also new in 2017, the eight-day Sensations of Southern France voyage from Lyon to Arles along the Rhône and Saône Rivers aboard the new Emerald Liberté visiting country villages with tours of the area’s castles, palaces and ruins. Emerald Waterways ships offers an inclusive pricing plan. The cruise fare includes some flights (depending on market and special offers); all transfers; all onboard (and some on-shore) meals; unlimited tea and coffee, wine, beer and soft drinks with lunch and dinner; bottled water in the cabins replenished daily; continental breakfast, pre-dinner canapés and after-dinner sweets served in the top suites; free Wi-Fi onboard the ship; most shore excursions and all onboard and excursion gratuities. WOW air, Iceland's low cost transatlantic airline, lowered airline prices for traveling from the West Coast to Europe. For a limited time, $69.99 tickets will be available from Los Angeles International Airport (LAX) and San Francisco International Airport (SFO) to Stockholm (ARN), Copenhagen (CPH), Bristol (BRS) and Edinburgh (EDI). Prices from Los Angeles and San Francisco to Stockholm, Copenhagen, Bristol and Edinburgh are available for $69.99 one way including taxes. Bookings can be made at wowair.com. Prices from Miami and Boston to Iceland are now available from $99 one way including taxes. Bookings can be made at WOW Air. Prices from Boston to Frankfurt, London, Amsterdam, Paris and Berlin are now available from $129 one way including taxes. Bookings can be made at WOW Air. Prices from Miami to Frankfurt, London, Amsterdam, Paris and Berlin are now available from $149 one way including taxes. Bookings can be made at WOW Air. Fares will be offered for flights through Apr. 5, 2017. WOW air's California routes are serviced by three new Airbus A330 aircrafts. The airline operates the youngest fleet in Iceland with the lowest emission. Also available for purchase are $99 tickets from Miami (MIA) and Boston (BOS) to Iceland and to Paris, London (LGW), Amsterdam (AMS), Berlin (SXF), and Frankfurt (FRA) for $149 and $129 respectively. Launched in November 2011, WOW air connects 31 destinations across the U.S. and Europe with the Icelandic capital. Travel to Israel and take advantage of EL AL Israel Airlines’ seasonably low rates through Mar. 31, 2017: $799 from Boston, $869 from New York (JFK/Newark) and $999 from Los Angeles (airfare only). Hotel and air packages start from $999 per person and offer potential savings of up to $400. EL AL Israel Airlines and Daniel Hotels by Tamares offer a Hot Winter package that includes roundtrip economy class air on nonstop flights and a three night stay with daily Israeli breakfast at the Daniel Herzliya or Daniel Dead Sea (nightly dinner also included). Special offer is available for the West Boutique Hotel in Tel Aviv. This hotel package is $1,079 from Boston, $1,159 from New York (JFK/Newark), and $1,329 from Los Angeles with departures through Mar. 23, 2017. Prices are per person, based on double occupancy. The single supplement is $265 for three nights. Taxes and carrier imposed surcharges are included. With mild weather and fewer crowds, Spring is an ideal time to explore the French countryside. French Country Waterways makes it enticing with special savings on its barges – the 12-passenger Adrienne and Nenuphar and the eight-passenger Horizon II. While transiting France’s historic canal system, you take in the sights, sounds and fragrances of Burgundy and the Upper Loire. These all-inclusive six-night sailings depart weekly on Sunday and return the following Saturday. Special fares in April range from $4,695 to $5,195 per person, double occupancy, a savings of $1,200, subject to availability. In addition to learning about France’s history, you also experience the culture and sample the cuisine. Each day the barge’s captain escorts an optional but included excursion, taking you to historic castles, UNESCO World Heritage sites, small towns and working wineries. You can walk along the canal-side tow path, or independently explore the local area on one of the barge’s bicycles, knowing the barge will be within easy reach on your return. Every itinerary includes a dinner ashore at a Michelin-starred restaurant, and gourmet dining onboard the barge. Lunch and dinner are accompanied by a selection of wines, including many from Premier and Grand Cru vineyards, giving you the chance to sample more than two dozen varieties during the course of the journey. Special room rates are offered at the designated meeting point hotels in Paris and/or Strasbourg for guests wishing to extend their stay. Be among the first to stay at the new Grove Resort & Spa, in Orlando, FL, which features suites on Lake Austin, a surf park and multiple dining options. The residential-style accommodations come with transportation to and from Disney. The Grove Resort & Spa opens March 10, 2017. The longer you stay, the more you save, up to 40 percent off. Stay seven nights or longer and save 40 percent. Stay from Mar. 10 to Apr. 4, 2017, and earn a free suite upgrade. To receive the longer you stay, the more you save rates, book by Mar. 10, 2017 for travel Mar. 10 to June 15, 2017. Introductory special reservations are not changeable and are non-refundable if canceled. First night’s room and tax deposit is required at the time of reservation. Deposit is non-refundable. Offer is subject to change and may not be combined with any other special or package. There is also an advance purchase package for 20 percent savings on suite accommodations. You must book at least 21days in advance to receive the discount. The offer is subject to change. Grove Resort & Spa or 844/203-0209. Since détente between the U.S. and Cuba began in December 2014, most travel related costs soared due to a massive spike in U.S. and Canadian travelers. Mandated price increases from state agencies and hotels, to cool down overheating demand, has finally waned. For the first time since early 2014, prices from state run agencies and hoteliers have decreased this spring, summer, and fall. InsightCuba, a tour operator providing legal travel to Cuba since 2000, is passing the savings on to consumers. InsightCuba launched its Spring Savings promotion saving you $500 per couple ($250 per person) on eight of its people-to-people tours from May through October 2017. Undiscovered Cuba - 11 nights - tour goes from east to west. Prices from $5,645 per person, double occupancy. Classic Cuba - seven nights - explore Trinidad, a UNESCO World Heritage Site and colonial town. Stops include Cienfuegos and Playa Larga. Prices from $4,545 per person, double occupancy. Legendary Cuba - six nights - experience city and country life in the eastern province of Pinar del Río, known for national parks, tobacco fields and peasant farmers. Prices from $4,245 per person, double occupancy. Vintage Cuba - five nights - go back in time through the country's colorful, complex history. Prices from $4,145 per person, double occupancy. Jazz in Havana - four nights - groove on Cuba's jazz on this musical journey through the Havana and Matanzas. Prices from $3,845 per person, double occupancy. InsightCuba's Spring Savings promotion or 800/450-2822. The National Pest Management Association (NPMA) reminds you when hitting the roads, skies and railways to take the precautions to reduce encounters with bed bugs and offers advice on ways to avoid bringing the pest home. Bed bugs are excellent hitchhikers because they are easily transported from one place to another in human belongings, such as suitcases, purses and laptop bags. This makes you susceptible to picking up bed bugs regardless if staying in a hotel or at a relative’s house. Some common signs of bed bugs include pepper-like stains on fabric-covered items, molted bed bug skins, the bugs themselves in various life stages, white eggs and empty egg casings. Thoroughly inspect the room for the presence of bed bug indicators when arriving at your destination. This includes pulling back the bed sheets to examine the mattress seams, checking behind the headboard and looking in furniture crevices. A small flashlight can help in this investigation. If a bed bug infestation is suspected, immediately notify management or property owners, and request a new room. It’s also good practice to vacuum your luggage and wash and dry all clothes – even those that have not been worn – on high heat when returning home. Click here for information on bed bugs. To help save on winter getaways, Courtyard New York/Manhattan Upper East Side teamed up with a local restaurant to offer a seasonal special. The deal is available through Mar. 31, 2017. Take advantage of a limited-time breakfast deal that offers up to 50 percent off regular rates in addition to a daily voucher for delivery or dine-in at Midnight Express Diner. Four blocks from the Upper East Side hotel, Midnight Express Diner is open daily for breakfast, lunch and dinner and offers 24-hour delivery service. Breakfast is available all day. Guest room and suites offer plush bedding, flat-panel TVs with premium cable channels, and free Wi-Fi. Additional amenities include a kitchenette with a mini-refrigerator and microwave. Courtyard New York/Manhattan Upper East Side is near Central Park, Yankee Stadium and the Metropolitan Museum of Art. The hotel features 15 floors with 210 rooms, 16 suites and three meeting rooms. Guests have access to free Wi-Fi and a fitness center with a sauna and steam room. Use promotional code S4B when making reservations online or by phone for the stay for Breakfast deal. Courtyard New York/Manhattan Upper East Side or 800/228-9290. The New World Millennium Hong Kong Hotel, a landmark on the waterfront of Victoria Harbour in Tsim Sha Tsui East, Hong Kong, launches the “Suite Stay” package offering up to 50 percent savings for stays in their 66-square-metre Harbour View Suites or 84‑square-metre Deluxe Harbour View Suites. The offer is valid until Dec. 31, 2017, and includes access to Residence Club privileges and benefits. Discount of 30 percent on selected services at the Business Centre. New World Millennium Hong Kong Hotel features 464 guestrooms and suites. Recreational facilities include a health club and a rooftop pool. New World Millennium Hong Kong Hotel “Suite Stay” package. Early booking rates are available through the end of July 2017 for Arctic and Antarctic cruises in 2018-19 with Poseidon Expeditions. Cabin discounts are up to 20 percent off the regular rate, depending on category reserved. Poseidon Expeditions focuses on remote polar cruise exploration in the high latitudes, offers May through September cruises in the Arctic and October through February itineraries in the Antarctic. The 114-passenger expedition ship Sea Spirit serves both regions. Applying the early booking discount, Arctic rates in 2018 for the all-suite Sea Spirit begin at $4,660 per person if three people share a Triple Suite. This rate applies to a June 27 to July 5, 2018, West Spitsbergen and Polar Ice Edge/ Searching for Polar Bears adventure. This same suite for three with the early booking discount brings a Nov. 26 to Dec.7, 2018, Antarctic Peninsula tour to $7,564 per person. Double occupancy rates for these departures begin at $6,596 and $10,204, respectively. Sea Spirit offers all-suite accommodations ranging from 215 to 463 square feet. There are two multi-purpose lounges for educational programming and entertainment, a restaurant that can accommodate all passengers in one seating, a polar library, and outdoor deck space to enjoy the polar landscapes and wildlife. Activities on and off the ship are directed by a team of bilingual polar guides, scientists and educators. Guests are offered opportunities to venture from the ship. Shore landings provide the chance to explore and to partake in guide-led interpretive walks and photography workshops. Sea kayaking and Zodiac cruising are offered in both polar regions and camping can be arranged in Antarctica. The ship’s expedition staff-to-passenger ratio is 1:9. Antarctic cruises embark from Ushuaia, Argentina. Other destinations in this region of the Southern Ocean include the Falklands and South Georgia Island, once a whaling center and the final resting place of explorer Earnest Shackleton. Icons of the area are penguins, seals, sea lions, whales and birdlife, including albatross. Arctic-bound cruises include a focus on the region’s wildlife – walrus, polar bears, reindeer, arctic fox, whales and birdlife, and delve into the history of polar exploration. Early summer travelers will come face-to-face with the culture of the Intuit and past visits of Vikings. In this landscape of sea ice and icebergs, the Northern Lights are always a possibility on late summer departures. The High Arctic region known as the Franz Josef Land Archipelago has been visited by few people because of multi-year sea ice. Access by ship is possible only a few weeks each summer. Poseidon Expeditions is the only company offering dedicated cruises from Longyearbyen, Svalbard to this archipelago of 191 uninhabited, volcanic, mostly glaciated islands that are part of the Russian Arctic National Park. Oglebay, West Virginia’s golf destination in Oglebay Park in the Appalachian foothills has spring stay-and-play packages for affordable golf getaways. Oglebay’s golf amenities feature layouts for all abilities, including two 18-hole layouts at the Speidel Golf Club designed by Robert Trent Jones, Sr. and Arnold Palmer. The Crispin, the resort’s original course, ideal for warm-up rounds, seniors and beginners. Oglebay also offers two driving ranges and a family-friendly par-3 course. Instructional Package – From $150 per person, per night, double occupancy, you receive 90 minutes of instruction with an Oglebay PGA professional and a round of golf on the Jones or Palmer courses. The package includes stays in the Wilson Lodge and a breakfast buffet. Birdie Weekday Package – Available Sunday to Thursday through April 27, 2017, the package starts at $129 per person, per night, double occupancy, and includes a round of golf on the Jones and Palmer courses, and stays in the Wilson Lodge. Play on the Crispin Course is included based on availability (golf cart not included). Club storage, range balls at the Speidel Driving Range and Mountaineer Breakfast Buffet are also included. Eagle Weekend Package – Available Friday through Sunday, the package includes a round of golf (with GPS cart) on the Jones and Palmer courses, daily play on the Crispin Course (subject to availability, golf cart not included). Starting at $299 double occupancy, with a two-night required stay, the package also offers accommodations in the Wilson Lodge, range balls at the Speidel Driving Range and the Mountaineer Breakfast Buffet. Oglebay is an hour’s drive from Pittsburgh and accessible from Columbus, Charleston (W.V. ), Cleveland, Cincinnati, Detroit and numerous Midwest and Northeast metropolitan areas. Silver Airways reduces its Key West fares up to 50 percent and eliminating change fees on all Key West flights. Silver Airways is testing a new everyday low fare concept and eliminating change fees on all flights to/from Key West. Published Key West fares with seven, three, and zero-day advance purchase are now up to 50 percent lower than published fares prior to Feb. 1, 2017. In addition, there are no change fees for any flights that depart from or arrive in Key West. Tickets are non-refundable and non-transferable. Changes can be made for free plus the difference in fare, if applicable. Tickets purchased from Silver Airways reservation call center will cost an additional non-refundable $25 per customer, per itinerary, or $35 more if booked at an airport ticket office. Silver Airways Key West fares (including all taxes and government imposed fees) start from $89 at the airlines web site. The $89 fare is for a one-way 21-day advance purchase from Key West to Fort Lauderdale. Silver Airways’ test will continue through May 31, 2017, and if successful, could be expanded to other markets. Silver Airways operates within Florida, between Florida and the Bahamas, and between the U.S. and Cuba with hubs in Fort Lauderdale, Orlando, and Tampa. Silver is a codeshare partner with JetBlue, United Airlines, and Avianca, and has interline agreements with American Airlines, Delta Air Lines, Air Canada, Alaska Airlines, Bahamasair, Hahn Air, Azul Brazilian Airlines, and All Nippon Airways. Imagine taking your dream cruise after finding a cruise price reduction of 65 percent. Thanks to Cruisewatch.com, you can find a cruise price reduction to nearly any destination. Cruisewatch.com, a search engine that matches customers with cruises, released a report showing that the average cruise price reduction is 16 percent. The same report indicates that shoppers can find discounts of as much as 65 percent if they use the right booking tool. Cruisewatch.com regularly publishes cruise evaluations and prepares an analysis of all cruises for the year. This analysis uses more than 6,000,000 data points to evaluate the average and maximum price reductions each cruise company has offered during a booking period. The cruise companies use different pricing strategies and can be divided into two groups. The first group has flexible prices, while the other group offers more stable pricing. The cruise lines with flexible pricing quickly react to changing market situations. This flexibility allows them to balance supply and demand easily. It also allows them to offer cruise price reductions. The cruise lines with more stable pricing models prioritize stable and reliable fares. On average, consumers can see 16 percent savings over initial pricing. Savvy consumers can see up to a 65 percent cruise price reduction on select trips. Holland America Line leads the group with flexible prices. Holland America offers an average 23 percent savings over the initial price. Bargain hunters can find a near 60 percent cruise price reduction. Norwegian Cruise Line, Royal Caribbean, Princess, and Seabourn are other cruise lines that pursue a similar pricing strategy. Carnival Cruise Line heads the group that pursues a more stable pricing model. Other major cruise lines such as Costa and MSC also use a more stable pricing model, but occasionally offer last minute discounts. Ponant, a smaller cruise line, frequently offers discounted cabins, but tends to wait until shortly before departure to offer moderate cruise price reduction. The search engine Cruisewatch.com offers free price drop monitoring. The website processes massive amounts of data using intuitive software that will help find the perfect cruise: at the right time, at the best price. You can receive automatic alerts when prices are reduced or when good deals are on the horizon. A price forecast is built into the website. World Spree Travel’s 10-night Amazing Vietnam trip is a good deal but early-birds who plan ahead will find that September/October prices range from $1,799 to $1,899. This covers roundtrip international air, including taxes and fuel surcharges; all transportation and transfers in Vietnam; hotel accommodations; an overnight cruise on Halong Bay; daily American buffet breakfast; four other meals; private sightseeing tours and entrance fees; professional, English-speaking tour guides; baggage handling; and no scheduled shopping traps. But price and value are not the only attractions. This country, lapped by the South China Sea, has friendly people, a beautiful landscape and a history dating back 5,000 years. Over the centuries it was occupied by China and France, both of whom left influences in its culture, architecture and cuisine. The tour takes in Hanoi, with its French-colonial buildings and mementos of Ho Chi Minh. It includes an overnight cruise on a little cruise ship on Halong Bay, famous for its limestone peaks and islands. There’s a glimpse of Danang and China Beach on the way to Hoi An, an old port town then Hue, the former imperial capital known for the Citadel. Then a flight to Saigon, officially known as Ho Chi Minh City, with its French-colonial landmarks and wartime headquarters of the South Vietnam government. There are optional excursions: a tour of Hanoi’s Old Quarter and the “Hanoi Hilton” prison; a cyclo tour of Hue, with dinner at the Imperial Citadel; a dragon-boat cruise on the Perfume River; a cruise to the Mekong Delta; and a trip to the underground Cu Chi Tunnels. To take advantage of China Airlines’ stopover in Taipei, there’s an optional two-night package to see Taipei’s museum. All prices are per person, double occupancy, and are subject to availability. There is no extra charge for credit cards. World Spree Travel Amazing Vietnam tour or 866/652-5656. Branson Airport (BKG) will offer new air service on VIA Airlines to Austin (AUS), Chicago (MDW), Dallas (DFW), Denver (DEN) and Houston (HOU). Discount flights begin May 25 through Sep. 5, 2017, and are on sale with promotional one-way fares as follows, including taxes and fees to each market. Promotional one-way fares are available for purchase through Mar. 13, 2017. Promotional fares offered include all taxes and fees and are subject to availability. Restrictions apply. Travel to these destinations on Via Airlines will be on a 50-seat Embraer ERJ-145 regional jet. Book flights at Fly Branson, or 407/641-4108. Now is the time to plan weekend escapes. Every weekend is an opportunity for adventure and spontaneity. If you've been putting off traveling because you think it's too expensive, it's time for a fresh approach. These five smart tips can help you plan a trip while staying on budget. Extend the weekend - A week-long vacation is wonderful, but it can use those vacation days up quickly. Instead, opt to extend three-day holiday weekends by one day so you get four relaxing days to explore a new city. You'll only have to use one vacation day. Analyze travel modes - With low gas prices, it can make sense to drive rather than fly, especially with a family. To compare costs, check out the AAA gas calculator that allows you to estimate fuel costs to drive from various destinations across the United States. Then it's easy to compare to airline tickets and car rental costs so you can make the best decision for your travel crew. Find a hotel with extras - When researching accommodations, select a convenient hotel with lots of amenities. For example, Hampton by Hilton hotels offer a free, hot breakfast served daily (or Hampton's On the Run Breakfast Bags when you're on the move). Other extras include free Wi-Fi, coffee and a fitness center and/or pool at most locations. Choose a two-in-one location - Consider jump-off cities nearby so you can explore two areas in one trip. For example, stay in Washington, D.C. and then head to Baltimore's Inner Harbor. Perhaps a family vacation to Orlando includes a day trip to Daytona Beach. Or if you're trying to please multiple family members, visit Las Vegas and then the Grand Canyon for an outdoor adventure. Eat on the cheap - Eating can be the most expensive aspect of travelling. Save by planning meals and snacks strategically. First, take advantage of a hotel with free breakfast. Then pack snacks such as nuts and dried fruit to curb hunger throughout the day. For meals, opt for local eateries rather than restaurants that cater to tourists. You'll get authentic foods often at a lower price. Finally, picnics are great for saving cash, so head to a local market to grab sandwich and salad essentials to feed the whole group on a dime. Check out Hampton Seekender for more travel tips. South of the Virginia border near Interstate 77 lies North Carolina’s Yadkin Valley, a place that’s becoming a hot spot for wineries. The area seems like an idyllic location for vineyards with rolling foothills that stretch west into the base of the Blue Ridge Mountains. The Yadkin Valley, of which we explored the portion in Surry County, may not have that white-hot trendiness of Oregon’s Willamette Valley or California’s Sonoma. But the wineries in the region are producing award-winning wines. Many people may not realize that North Carolina had a long wine tradition. Before Prohibition, North Carolina produced more wine than any other state. Twenty five wineries were producing sweet wine from muscadine grapes, a grapevine species native to the southeastern and south-central United States. Prohibition banned the manufacture and sale of alcohol and effectively killed North Carolina’s wine industry. After Prohibition was repealed in 1933, few wineries were able to reopen. Tobacco replaced grapes over the years as the valley’s mix of clay and loam soils proved excellent for growing tobacco. But as public campaigns to stop smoking took hold, the use of tobacco declined, and farmers looked for other profitable crops to grow. Remembering the wine industry of the past and the state’s long, warm growing season and mild winters, grapes came back into favor. Rather than growing muscadine grapes for sweet wine, the biggest growth has been with European vinifera grapes used to make merlot, chardonnay and other dry wines. 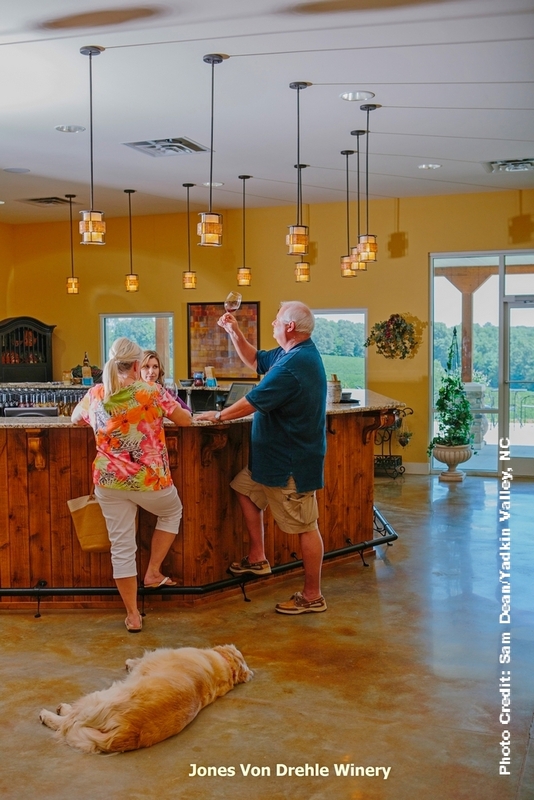 The Yadkin Valley’s wine industry took a big step forward in 2003 with the designation of the Yadkin Valley American Viticulture Area (AVA), which allowed wineries to bottle under a single geographic pedigree. This AVA was the first AVA in North Carolina and brought new wineries to the Yadkin Valley. The Yadkin Valley now includes all or part of two AVAs: Yadkin Valley and SwanCreek. Many winemakers consider Yadkin Valley the best terroir, or wine-grape climate and growing conditions, in North Carolina. Charlie Shelton, who along with his brother Ed, opened the valley’s flagship winery, Shelton Vineyards in 1999. Shelton said “the soil conditions are almost identical to Burgundy, France.” Commonly planted vinifera grape varieties in the western and Piedmont regions of North Carolina include Cabernet Sauvignon, Cabernet Franc, Merlot, Syrah, Chardonnay and Viognier. Harvest time for Yadkin Valley grapes generally lasts from late August to early October. Traveling between wineries can be a perfect way to spend a weekend. 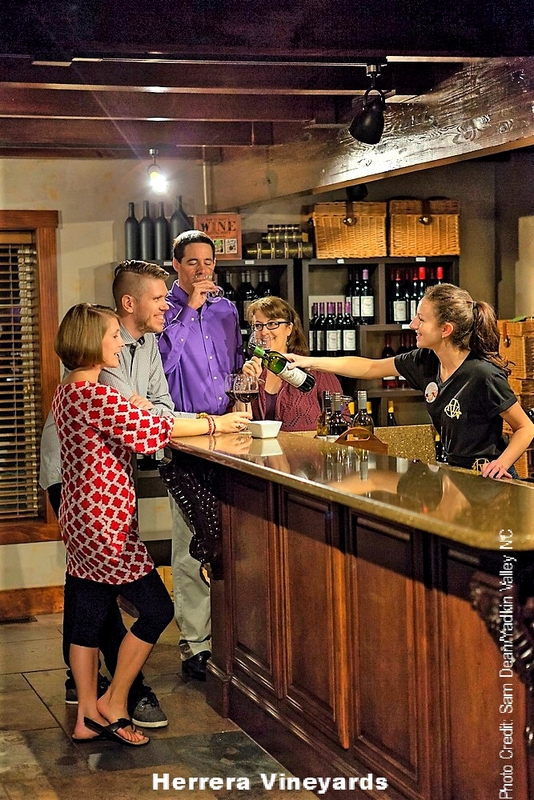 If you want to plan your own trip, be it boutique or estate wines, and create a “winetinerary” in Surry County, check the Yadkin Valley web site, with links to many local wineries. Here are a few of the wineries we visited. 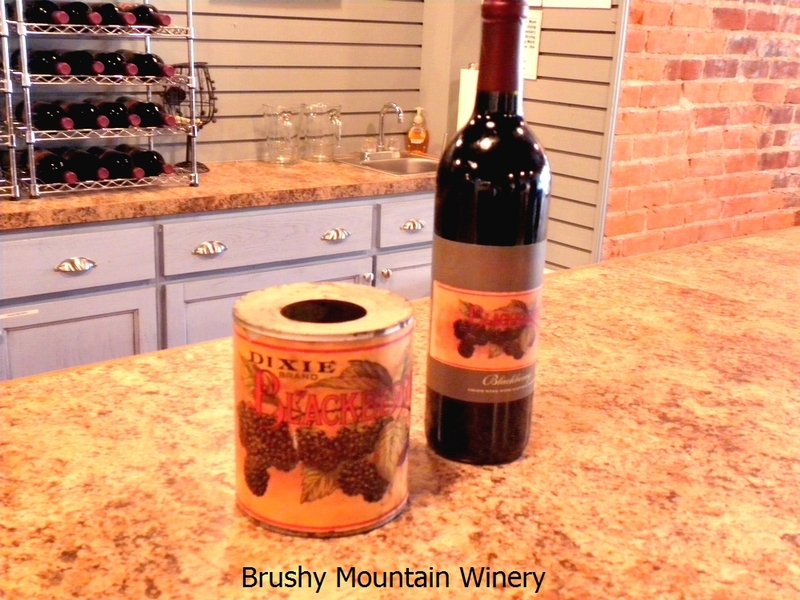 Brushy Mountain Winery - 125 West Main Street, Elkin 28621; Phone: 336/835-1313 Located in historic downtown Elkin, the Brushy Mountain Winery is housed in a building that dates to the 1900s. You may not realize there is a winery in a store front and drive pass. The remodeled tasting room is home-like with sofa, chairs and small tables for tastings. Trendy and tradition coexist as local art decorates the walls and an original brick interior wall remains. As an urban winery, Brushy Mountain owner Jason Wiseman buys locally grown fruit from farmers and vineyards within a 10 mile radius and produces his wines in the basement. Wiseman returned to North Carolina from Napa Valley as he saw promise in the wine industry here. “Small, boutique wineries opened up and we saw these small guys making fantastic wines,” noted Wiseman. Production is small. The goal is 1200 cases in 2017 and many of Brushy Mountain’s wines are named after civil war and revolutionary war legends. The labels of the fruit wines were designed from the labels of the Elkin Canning Company, which ran its business out of the same building. Wine tastings $7 per person. Open Thursday 1 to 5 p.m., Friday and Saturday Noon to 8 p.m., and Sunday 1 to 5 p.m. Entertainment hosted onsite most Friday, Saturday and Sunday evenings. 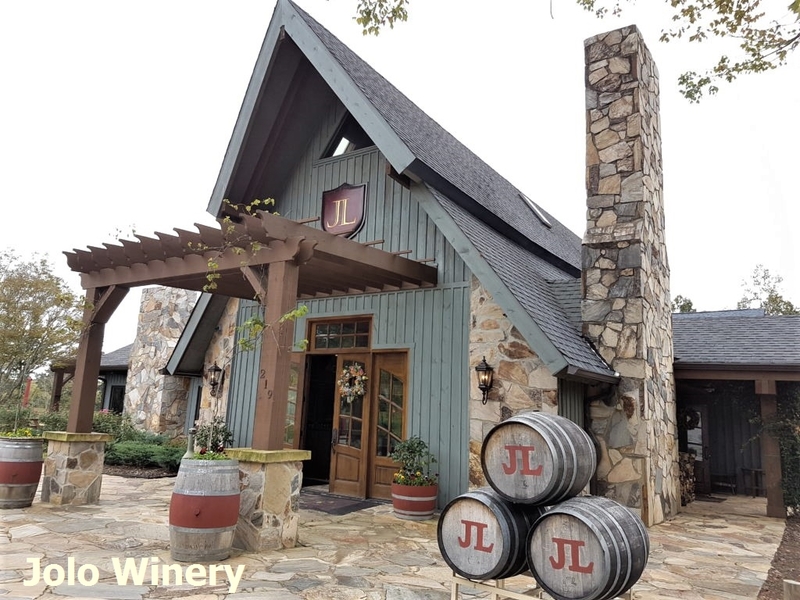 JOLO Vineyards - 219 Jolo Winery Ln, Pilot Mountain, 27041, Phone: 855/565-6946 – Opened in April 2014, Jolo gets its name from the children of owners J.W. and Kristen Ray. The Rays chose Surry County because of the climate, soil and winemaking program at Surry Community College. Near Pilot Mountain, the grounds of the 80-acre property are lovely and extensive, a 180 degree difference from urban Brushy Mountain. From the expansive outside seating on the patios, you can enjoy a glass of wine and the lovely view of Pilot Mountain and the vineyards contouring around a pond. End Posts restaurant, named after the rose bushes at each end of the trellises that hold up the growing grapes, offers a Tapas style menu while wine tastings also take place at the tasting lodge. J.W. and Kristen Ray are relatively new to viticulture, but early results are positive. In the 2016 North Caroline Wine Competition, the winery won a double gold and four gold medals for five of their wines. Wine tastings start from $15 per person for two vintages of four wines that includes a light food pairing. The tasting includes a JOLO printed Riedel Glass. Tastings Thursdays, Fridays and Saturdays 10:30 a.m. to 6:00 p.m. and Sundays noon to 5:00 p.m.
Jones von Drehle Vineyards & Winery - 964 Old Railroad Grade Rd., Thurmond; Phone: 336/874-2800 - The partners of this family-owned estate are two couples: Diana and Chuck Jones and Ronnie and Raymond von Drehle; Diana and Ronnie are sisters. Jones von Drehle Vineyards & Winery was established in 2008 on 65 acres. The intent was not to save a family farm, but create one. Chuck Jones, with the discipline of coming from the telecommunications industry, tries not to overlook any detail and is committed to operating with as little impact on the environment as possible. “We try to use as few chemicals as possible in the vineyard and winery” says Jones. The winemaking philosophy is being “fruit focused” so you taste and recognize the varietal. Their Petit Manseng won best-in-state awards in its first vintage. Tastings $8 for up to eight wines. Open Wednesday to Saturday 11 a.m to 6 p.m. and Sunday noon to 5 p.m.
Shelton Vineyards - 286 Cabernet Ln, Dobson, 7017; Phone: 336/366-4724 - Charlie and Ed Shelton came home to Surry County in the late 1990s with a vision to plant grape vines to grow the area’s economy and create jobs. Nearly 20 years later, they own the largest family-owned estate winery in North Carolina. When you arrive at the vineyards, the first thing that you notice is the sheer size, nearly 400 acres. The “granddaddy” of North Carolina vineyards, the brothers own and operate the vineyard and both have houses on the property. They harvest grapes by hand, use a windmill to help ward off frost and plant rose bushes at the end of each vine row (ala the practice in Burgundy) to alert them to disease or problems with the grapes. Once pressed, the juices make their way through the winery’s state-of-the-art gravity flow system before being aged or bottled on-site. Each action is done with an eye toward producing the best quality product, which propelled Shelton to international success. 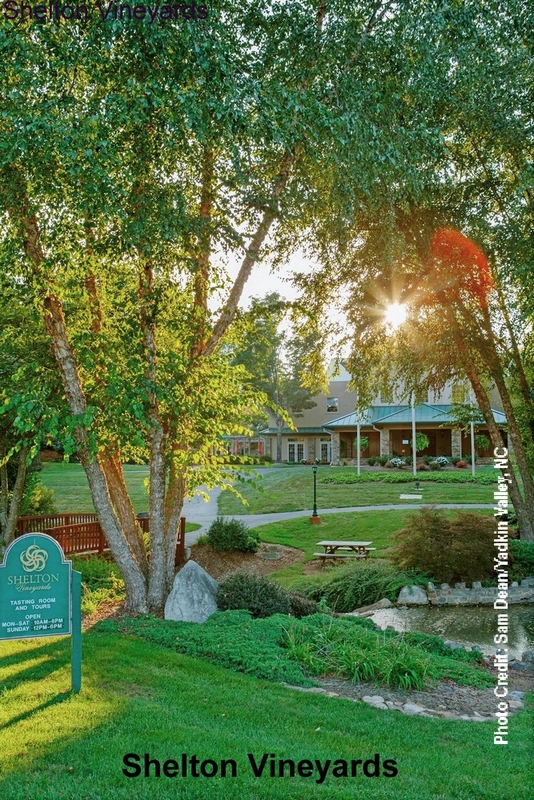 In addition to the vineyards, the Shelton property includes the Harvest Grill, the property’s bistro restaurant and a large parcel of beautifully landscaped open space for visitors to enjoy. Wine tastings $6 per person for standard or $25 per person for reserve wines. Tours and tastings daily. Open Monday to Saturday 10 a.m. to 5 p.m. and Sunday noon to 5 p.m.
Herrera Vineyards - 206 Vineyard Lane, Dobson 27017; Phone: 336/374-6164 - Formerly the site of Black Wolf Winery, Herrera Vineyards and restaurant is a mile outside the town of Dobson. The property has more than 140 acres of vineyards, rolling hills and riverfront. Sisters Monica Herrera-Rangel and Carolina Herrera-Ochoa purchased the former Black Wolf Vineyards and began selling wines from grapes grown at family-owned vineyards. You drive through the vineyards to reach the tasting room and restaurant. A wide sweeping patio, with two 75-foot wide terraces has tables and chairs and a waterfall. The patio is the perfect place to view the vineyard. Like Shelton, Herrera is one of a handful of North Carolina wineries that have a restaurant. Lunch is served Tuesday through Sunday, dinner Thursday through Saturday and a Sunday brunch. Their Southwestern style villa exterior compliments the striking tasting room/restaurant combining rich wood textures with hand-made iron fixtures and accents. Their dry Reisling was voted best white overall at the state fair. Reisling is their best-seller and they make a dry and semi-sweet version. Herrera was the first in the area to bottle a sangria. Tasting Room and Restaurant Hours: Tuesday and Wednesday 11 a.m. to 3 p.m., Thursday to Saturday 11 a.m. to 9 p.m., Sunday 11 a.m. to 5 p.m. Full flight tasting $12 - includes 12 currently served wines and souvenir wine tasting glass. The $5 sweet or dry tasting, for people who prefer one or the other. There are six wines in each of those tastings, so six wines for $5. You can also pick six wines for $5 if you prefer semi-sweets or pay $1 per taste if you only want to taste a few wines. Yadkin Valley Wine Festival - Elkin - Is held annually on the third Saturday of May (May 20 in 2017) to showcase wines produced in or from grapes grown in the Yadkin Valley. If you go – The Hampton Inn & Suites in Dobson, NC is owned by Shelton Vineyards and is a convenient jumping off point when visiting area vineyards and wineries. It’s the only hotel in the Hampton chain that features a wine bar. Dobson NC 27017 336/353-9400. The 2017 Budbreak Wine and Craft Beer Festival will be held May 6, 2017. Yadkin Valley Grape Festival - Yadkinville - Is held annually each October. For more information contact Yadkin Valley, NC. You can explore the Arctic in style, on a dedicated vessel with expert wilderness guides and lots of included activities with Intrepid Travel and receive an early bird discount. Book any of the Arctic departures before Apr. 30, 2017, and receive up to $3,500 off your voyage. The offer is valid for new bookings for 2018 departures June through September and spaces are limited. You receive $1,000 off voyages of up to six days in standard cabins, $1,500 off voyages of up to six days in premium cabins, and $1,500 off voyages of nine to 11 days in standard cabins. This does not apply to quad and triple cabins. Your full name must be provided at time of booking. Discounts are per person and can only be combined with the five percent Shackleton Club past passenger discount. The discount applies to voyage only and not towards North Pole voyages, land-based programs, adventure options, additional hotel accommodations, pre/post tours, insurance, flights, or group bookings. Peregrine/Intrepid has the right to limit, change or discontinue the promotion at any time without notice. When you book before Apr. 30, 2017, a reduced deposit of five percent applies. The deposit is non-refundable and the balance of 20 percent of your deposit is due 180 days prior to departure. Full payment is due 120 days prior to departure.